Winning research grants is exciting, but that’s only the beginning. 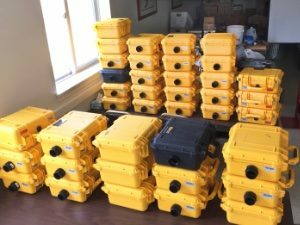 Here’s some background on some of the challenges we faced in our project tracking migratory Indiana bats. 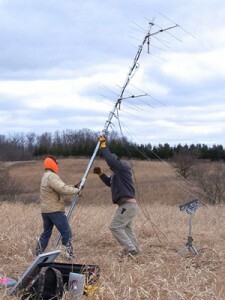 Putting up 40 telemetry stations across four states is an ambitious project! First we had to find good locations, which meant spending lots of time poring over Google Earth and lists of state parks and other public lands. Then we had to get approval for using the land, and any necessary permits. In some cases, there were no public lands in the areas we needed to cover, so we had to find private property owners who would be willing to let us put towers on their land. Next we had to figure out what equipment we would need, find the cheapest source, and have the equipment sent to Southern Illinois University at Carbondale. In some cases the equipment needed further manufacturing and assembly, as was the case with the special antennas we used at many of our sites. After that, it was time to hit the road. A marathon trip of over 5,000 miles in four weeks in March and April, setting up towers at 30 different locations, sometimes in rain and snow. Once our team got the hang of it, we were able to put up a tower in about three hours, and often two per day. But it was exhausting work. 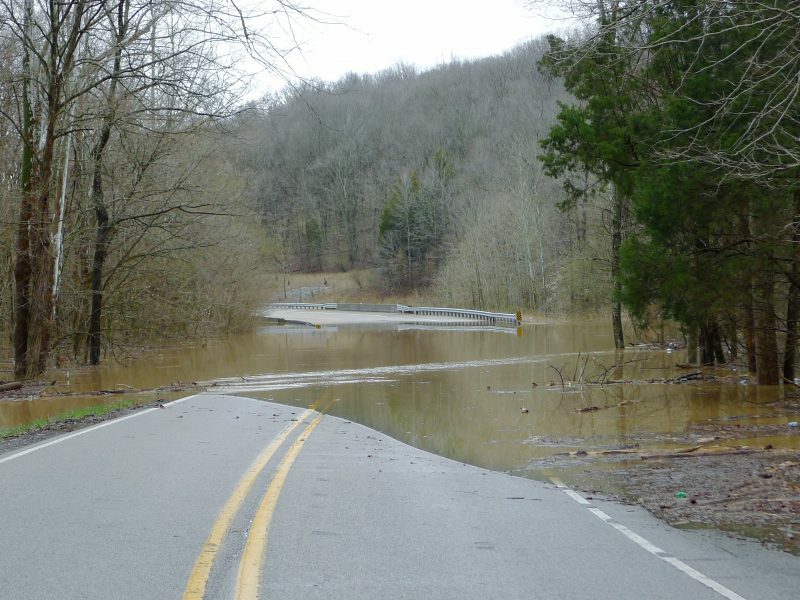 On several occasions we were unable to reach sites due to high floodwaters. Once, those floodwaters almost trapped us coming back from a site, and two sites were damaged when rivers overflowed their banks and inundated the equipment. Other field calamities included mice nesting in equipment bins and eating cables, and goats using tower guy-lines and solar panels as scratching posts. In autumn, we moved a bunch of the towers to different locations, so over the summer we got good at tearing towers down and putting them up again near bat hibernacula. 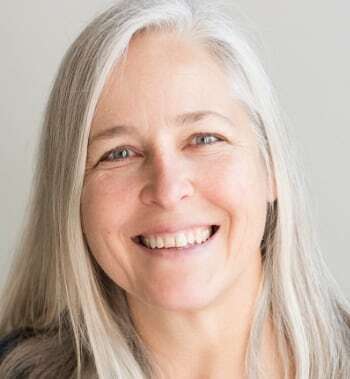 This usually involved hiking at least a mile through hilly woods, hauling heavy deep-cycle marine batteries and bulky fragile solar panels over downed trees, sometimes in the rain. Unfortunately for us, these bats used hibernacula deep in the woods, under tree canopy, which meant the solar panels didn’t work very well. That meant we had to swap batteries weekly — no need for a gym on this project! Once all the equipment was set up, we also had to periodically drive around to each site to download data and check on the equipment. It was a great opportunity to get to know the Indiana countryside. Once the telemetry stations were up and working, we needed bats to track. We caught bats in the spring after they woke up from hibernation and carefully glued special transmitters to trimmed fur between their shoulders. Each time a tagged bat flew within range of one of our towers we picked up a signal. By placing towers across the landscape, we were hoping to document bat movement between the hibernacula and summer roosts. Then in late summer when the bats returned to the hibernacula area for mating behavior known as swarming, we captured more bats and put more transmitters on them, to track their movements before hibernation. Witnessing swarming behavior at a major Indiana bat site like Wyandotte Cave was an extraordinary privilege and a peak life experience for me. The air was full of bats, but it was completely different from the mass cave exodus I had seen with the Brazilian free-tailed bats in Texas. During swarming, bats are flying everywhere in the woods, chasing each other and far more intent on their social interactions than anything else. Like other swarming bats in the U.S. Midwest, Indiana bats are seriously threatened by the double whammy of White Nose Syndrome and wind turbines. I hope that by documenting their migratory behavior we are able to help guide conservation efforts to maintain this amazing phenomenon. What did we find out? Read more about that in my next post.